Some plants just seem to work harder than others. 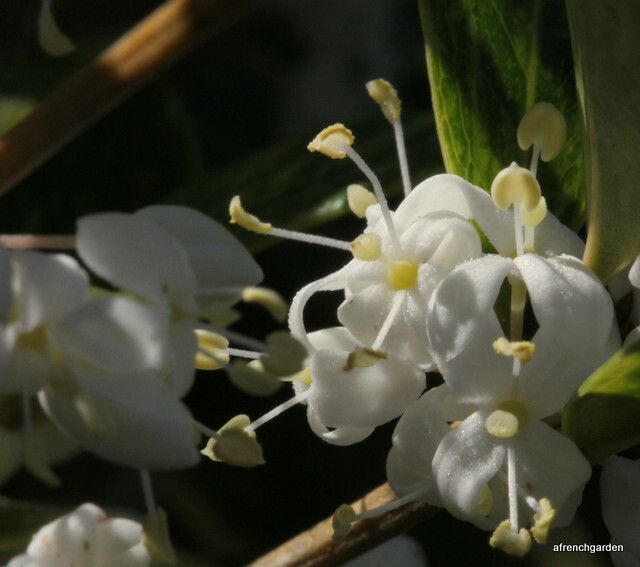 My Osmanthus heterophyllus ‘Goshiki’ is full of flowers and these tiny flowers emit a heady perfume. I wish it could be near a door but it sits in the shade of the wall to the back of the front garden, its glossy leaves providing a year long green backdrop. 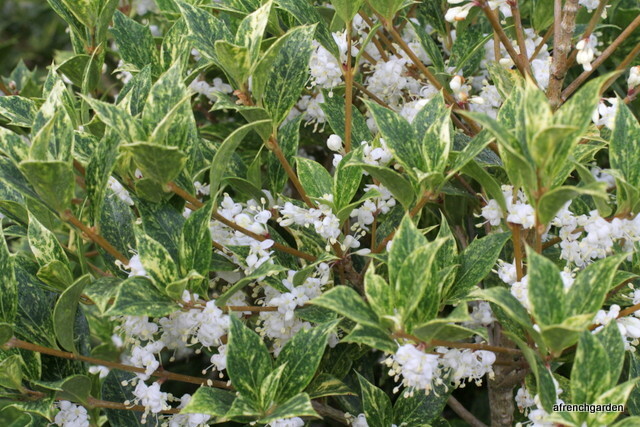 The RHS suggests it should be pruned in April or May or after flowering. We pruned it last spring and I think this is the reason for our heavy crop of flowers this year. The Persimmon tree is holding on to a heavy crop of fruit this year. I suspect some will soon be ripe enough for the birds to start to peck but the tree is too big to net. 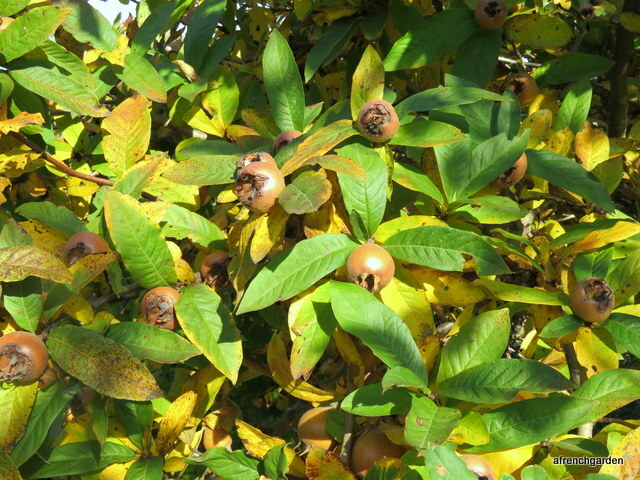 The Medlar tree is heavy with fruit too this year but they will not be ripe enough to eat for a while yet. I have made some discoveries about bumble bees. The first is that they like Nerine bowdenii but the second is an identification that has been puzzling me for some time. I am now sure that the bee above is an early bumble bee. How come early in October you say? Checking with BWARS they note for the U.K. the early bumble bee is “bivoltine in the south, with a smaller late-summer generation”. These must be Bombus pratorum queens, like the one in my saffron, but I have never seen any males or workers at this time of year and I wonder if some queens might come out of hibernation for a top-up of nectar before the final last months of hibernation. I also decided to try and and find out the meaning of pratorum (I erroneously guessed spring but Latin was always my worse subject). It appears that pratum is a meadow or hayfield so these are the bumble bees of the meadows. May there be many meadows for all the bumble bees. 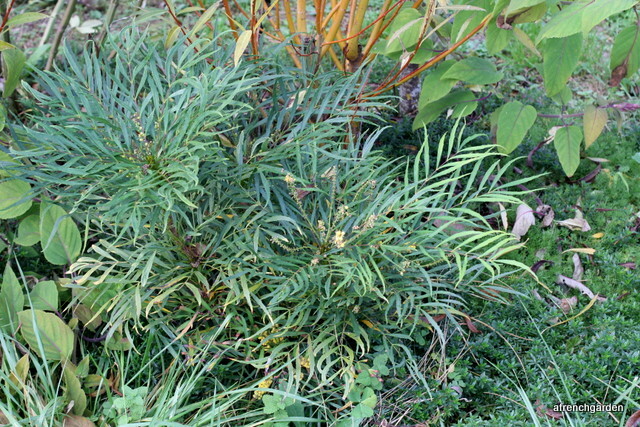 My Mahonia eurybracteata “Soft Caress” that I planted last year is just starting to flower. I had not realised it flowered so early but that is fine, I have other ones that will come on later too. I am just looking forward to see which of the bees find it first – my bet is the bumble bees. Another “discovery” or surprise was that I was able to make apple cider vinegar from our glut of apples this year. I love apples and we have been eating them raw, stewed and baked. They have also gone into jams, jellies and chutney but the vinegar is a new product for 2015. We can now take jars of our honey as well as apple cider to my daughter in the UK – sweet as well as sour. Categories: Garden | Tags: apple cider vinegar, Bombus pratorum, Mahonia eurybracteata "Soft Caress", medlar, Nerine bowdenii, Osmanthus heterophyllus 'Goshiki', persimmon, saffron | Permalink. I submitted two photos of BumbleBees I had been struggling with and they came back to me with identifications. You are very observant to work out your Bumblee identity, I find it quite tricky. One of the purposes of Bee Watch though is to encourage folk to get their “eye” in. 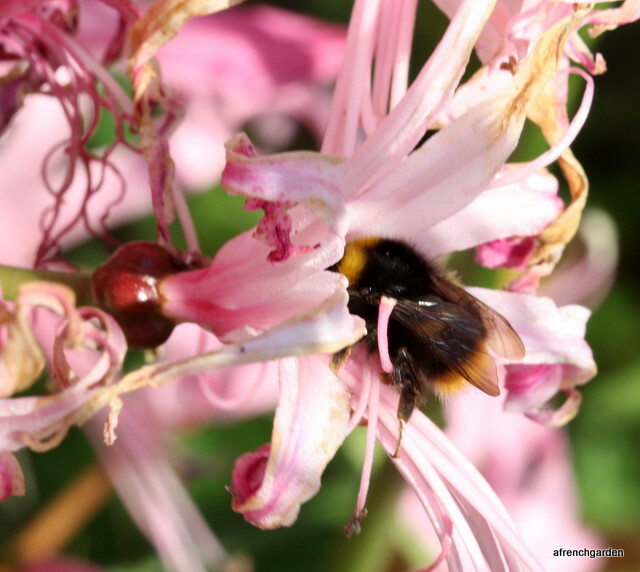 Your photo of the Bumble on the Nerine is really quite beautiful. Apple cider is new to me but sounds a lovely gift, we eat far less puddings than we used to and its good to have ideas for other uses. De inimico non loquaris eam. You’re very lucky to have so many flowers still blooming! Let me echo your ‘may there be many meadows for bees’, as well as many gardens like yours. Love the sweet and the sour produce from your garden. 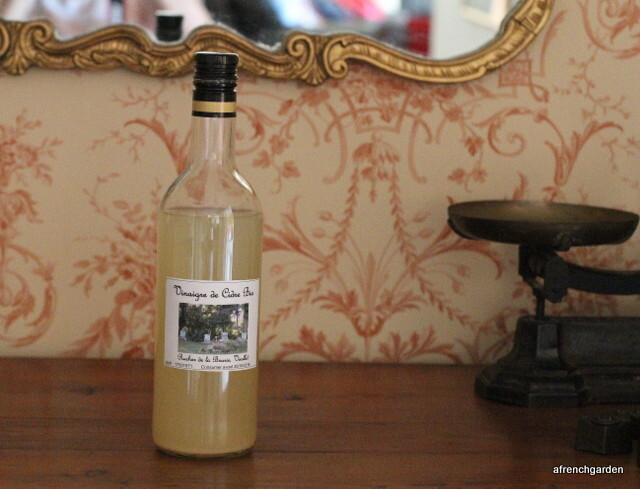 I always prefer to use cider vinegar rather than wine, it never seems quite so acidic. Perfect images of all the bees. There is a new series on the BBC about bees, I’ve just downloaded the first one; you could see it too if you have a VPN. Or someone will put it on Youtube, I’m sure. 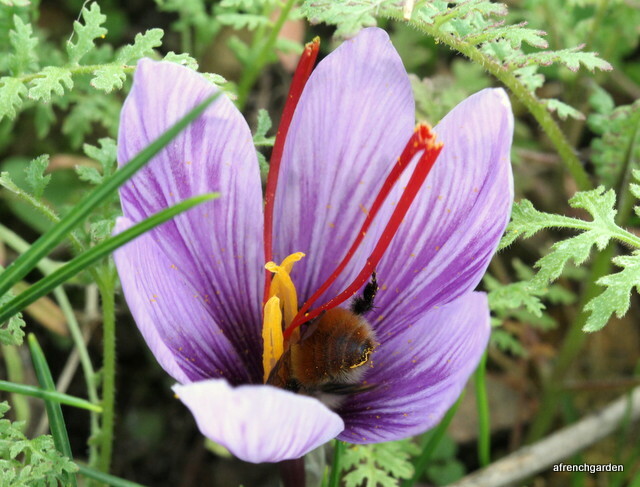 Beautiful bee pictures, I especially like the one where the bee is headfirst in the depths of the crocus. Your garden shots made me feel slightly envious as here in the UK we are in full Autumn, the clocks have changed and the light seems weak. 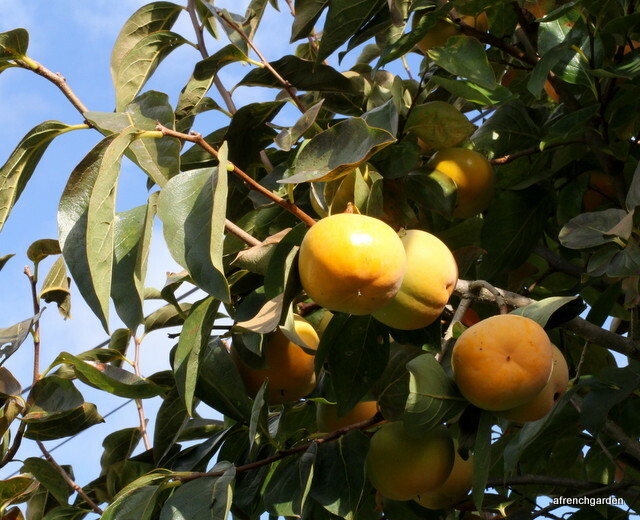 I have just looked up Persimmon tree, I had not heard of it before, how do you use the fruits? Cider vinegar is claimed to have many health giving properties, was it difficult to make? Really lovely photos Amelia. I’d be interesting in hearing more about your cider vinegar too. I use it quite a lot. I’ve never seen it cloudy before. Interesting to see the Early Bumblebees at this time of year. Unless you see workers it feels like your second idea (popping out from hibernation for a feed) is more likely.